Sheiks lost their first game against the Hawks with a score of 8-3. Today will mark there first lacrosse game. Not only is it their first game of the season, but it is the first game ever in this school. Today they faced North Valley Military Institution. We are fortunate to have the first game here. The Sheiks have been training rather fond. Practicing in the morning, often at lunch, and even on the weekends showing hard determination for their upcoming season. For those who don’t know, the lacrosse game is divided into quarter. The first quarter ended with a score of 1-2. Unfortunately, the team was losing. By second quarter, the team made a come back by tying up the game. The third quarter the Hawks scored 3 more putting them in the lead. 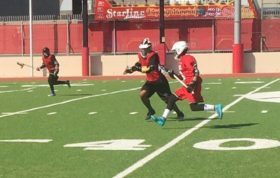 In the final quarter, Sheiks scored 1 while Hawks scored 3 causing the final score was 8-3 . Due to the lack of players, the Sheiks took their first lost. Currently the lacrosse team is welcoming anyone interested in playing a part in the team.